The video site contains both free and premium content. You do not need to be a paid member to view the free videos on the website. You do need to be a Paid or Free Trial Premium Member if you want to view the premium videos. If you are a Premium Member, log in to the website to view the premium videos. Free Trial Memberships will be available for a limited time and are restricted to one free membership per person. If you forgot your username, you can also log into the site using the email address you used when you signed up for your membership. If you forgot both, email customer service at nationalsewingcircle@program-director.net with your first and last name and we’ll send you your username. On the home page (www.nationalsewingcircle.com) click the log in button at the top right hand side of the page. Monthly Membership: Your monthly membership lasts for a 30-day period starting on the day you register and pay for your Premium Membership. Free Trial Membership: Your free trial membership lasts for the period of time designated by the Free Trial, starting on the day you register for your Free Trial Membership. There is no credit card required to sign up. Free Trial Memberships will be offered for a limited time and are restricted to one free membership per person. Your paid monthly or annual membership will automatically renew using the credit card we have on file, at the then-current rates. Monthly memberships will be charged approximately 5 days prior to the end of your monthly term. Annual memberships will be charged approximately 10 days prior to the end of your current term and you will be notified prior to the renewal. We do this to ensure uninterrupted access to your membership benefits and renewals are applied to the end of the current term. Your credit card statement will list your membership as PP* NationalSewingCircle, 1-855-208-7187. 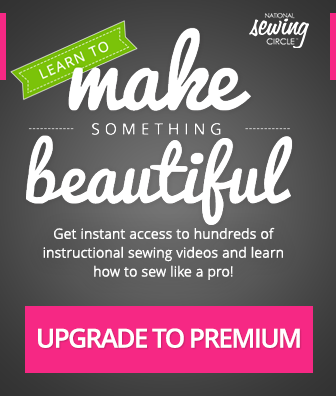 You can reach customer service by email at nationalsewingcircle@program-director.net, or at 1-885-208-7187 should you choose to remove your membership from automatic renewal. An Annual paid Premium Membership allows you to view all of the premium video content for one year from the start of your membership. The Monthly paid Premium Membership allows you to view all of the premium videos for 30 days. A Free Trial Membership allows you to view all of the premium video content for the period of time designated by the Free Trial, starting on the day you register for your Free Trial Membership. To obtain a refund, please contact us at 1-855-208-7187 or by email at nationalsewingcircle@program-director.net.